Rubber roofing comes in rolls of varying thicknesses of a rubber product with the technical designation of EDPM (ethylene propylene diene monomer.) Your roofing contractor will recommend a specific thickness based on the weather in your area, the size of the roof, and how long you expect it to last before needing replacement. The heavy material has all the properties you associate with rubber as to being weatherproof, waterproof and long lasting. 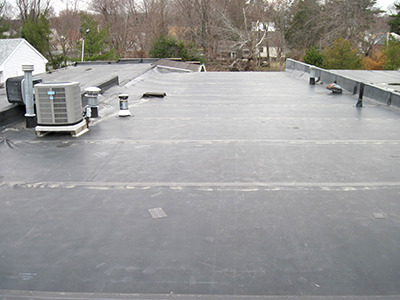 Rubber roofing is relatively easy for a professional to install. It is simply rolled out and cut to fit your rooftop. It’s mechanically fastened with specialty screws, then the fasteners along with any seams are taped off and sealed with a rubber based glue to fully waterproof it. In some cases it may be covered with a form of gravel made of smooth river rock. The simplicity of the system means the job is faster than installation of traditional roofing systems resulting in lower labor costs for the process. Rubber roofing is a great alternative to traditional asphalt, tar and gravel flat roof systems because of its reliable durability and weather resistance. Whether you’re constructing a new building or replacing the roof on a older one, be sure to ask about your options and determine if the rubber roof may be a solution to your needs.